Add the potatoes to a large bowl and rinse well under cold water. Transfer the shredded potatoes onto a large piece of cheesecloth and squeeze as much liquid out as possible. Add the potatoes back to the bowl and mix them with the onions, baking powder, eggs, matzo meal, salt and pepper until combined. Make 16 individual patties and place them on a sheet tray lined with parchment paper. Next, add the oil and schmaltz to a medium size frying pan over medium heat and cook the latkes until they are golden brown on each side and cooked throughout, about 4-5 minutes per side. 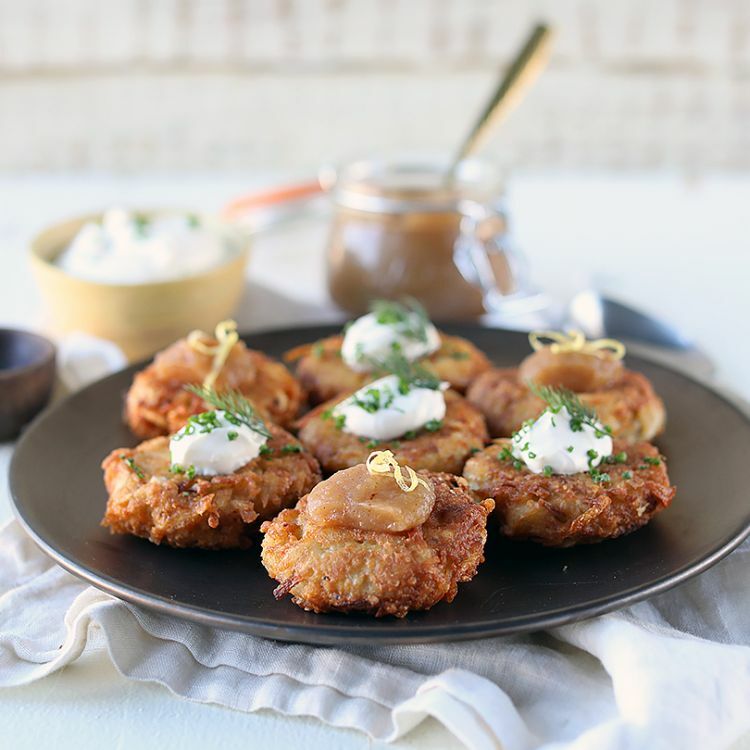 Drain the latkes and then serve them hot with optional garnishes.